At usefulresearchpapers.com you will find interesting research projects on astronomy topics. Summary: Mars in the evening. Jupiter and Saturn in the morning. In astronomy distances are confusing because of the large numbers of zeros in the figures. This is an easy-to-understand scaling of the Universe in space. Distances in space are represented by the time light takes to travel there. In astronomy times are confusing because of the large numbers of zeros in the figures. This is an easy-to-understand scaling of the Universe in time. The chronology of the Universe is compared to a real year. An account of how stars evolve and change the chemistry of the Universe. It turns out that the material that makes up our bodies and surroundings actually comes from within stars that died millions of years ago. Is the Earth the only planet with life? The possibility of life on other worlds is discussed. The essay is based on the knowledge we have at present. Defining life is a difficult aspect of this discussion. There is a small digression about UFOs. How do they differ? Why is one a science and the other a belief system? What are the assumptions behind astrology? What is the difference between the Zodiac constellations and the Zodiac signs? A table containing a list of the 20 brightest stars and explanations of all the associated terms like magnitude, spectral type and radial velocity. Tables with explanations about the Sun, Earth, Moon, major and minor planets, satellites, asteroids, KBOs and comets. Introduction to the various coordinate systems used in geography and astronomy. A brief introduction to total eclipses of the sun. Occurrence of eclipses (how often and where seen). A listing of the next few total eclipses of the Sun. Tips for travelling to eclipses. Read travel accounts for total eclipses in Java, Philippines, Mexico, Chile, India, Venezuela, England, Zimbabwe, Botswana, Turkey, Russia and China. If you have a web site about total eclipses of the sun, especially if you have seen one or more, join the Eclipse Chasers' WebRing. Essays on chemistry, the study of the interactions between different substances. A beginners' guide to astronomy. Lots of information about space exploration including the latest photographs the solar system and deep space. A British astronomy magazine with interesting information and good articles. 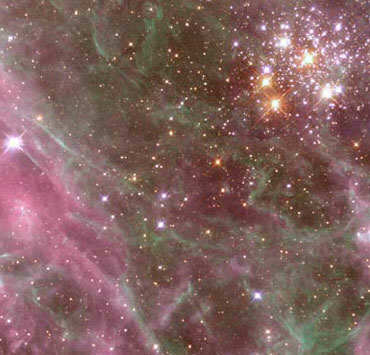 Stunning images from the Hubble space telescope. A frequently updated astronomy site full of news and articles as well as reference links. A reference resource on many subjects. Astronomy as the newspapers and television would like it to be. Information and sales of telescopes. Discussion of light pollution and its causes. A good resource for the budding amature. HappyChild is an excellent educational resource for children, full of interesting information.